2.Sift together the flour, cocoa, baking soda and salt; set aside. 3.Then cream together the shortening and sugar in a mixing bowl until it becomes light and feathery. Mix together the corn syrup and egg yolks. Beat in vanilla. 4.Add dry ingredients alternately with coffee to creamed mixture, beating well after each addition. 5.Now beat egg whites in another bowl until stiff peaks form; fold egg whites into cake batter. 6.Put batter into a greased 15x10x 2-inch baking pot. 7.Bake for about 45 minutes. Cool in pan on rack. 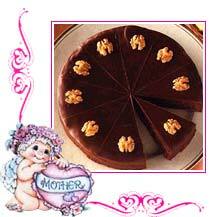 8.Now enjoy the delicious Mother's Day chocolate cake along with your family and friends!